Our mornings have hitherto been a somewhat casual, relaxed affair. French time being an hour ahead of where it sensibly should be, 8:00 AM feels like 7:00 AM. We have usually managed to drag ourselves into action having had the obligatory cuppa by 9:00 AM (which feels like 8:00 AM, of course). This morning was very different as we were stirred from slumber by a fearful roaring at about 7:30 AM (a.k.a. 6:30 AM) seemingly not far outside the caravan. A suspicion developed as to the source of the roar and a glance out of the window supported the suspicion that we were being buzzed by a low-flying hot air balloon. Hurriedly slinging on some clothes so as not to upset the other campers, we rushed out to see three or four balloons in relatively close proximity. These were rapidly followed by a hot air chicken (well, rooster complete with comb) and a hot air strawberry. 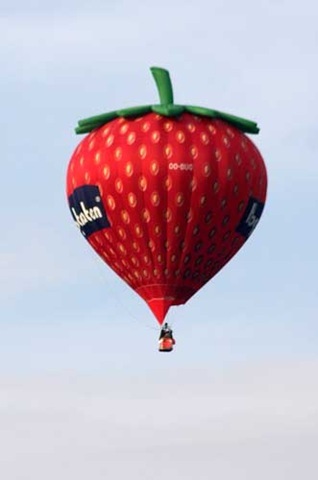 The balloons, poultry and fruit were launching from a field about 200 metres away. We counted 14 fans of les frères Montgolfier in all, including representatives from France, Britain, Switzerland and Belgium; quite an international collection. Follow that, if you can. We couldn’t, really. The early morning brightness deteriorated into cloud cover, though it stayed dry. We pedalled into Mon-prés-Chambord for a newspaper to keep an eye both on the weather forecast (looks pretty grim for the next few days) and the fuel price protests (the lorry drivers are joining the farmers and fishermen). A brighter interlude occasionally drifted by, including a very obliging one for lunch. We are in danger of growing roots waiting for the weather to settle so we’ve paid up and are moving off somewhere tomorrow, hoping for some quiet Sunday driving. 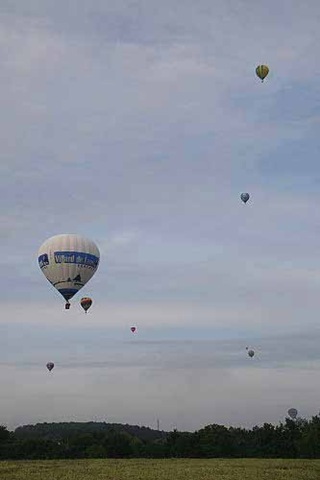 What absolutely fabulous balloons! 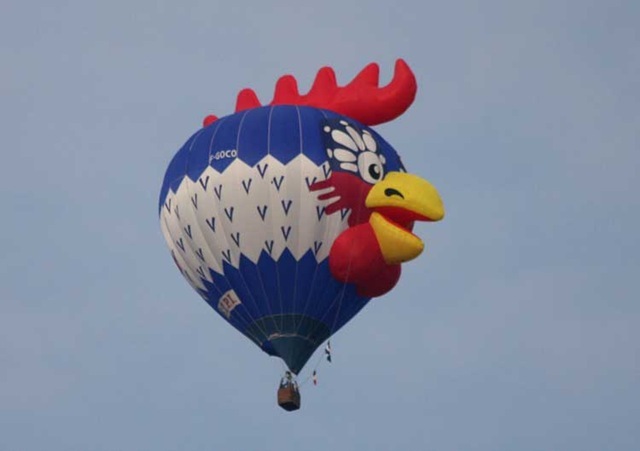 I want a trip in the cockerel one!! Roll on some good weather for you.